The IND 6th Avenue Line at 42nd Street/Bryant Park. R-46 car 6088 bringing up the tail end of an F service. Photo by David Pirmann, August 2008. The Sixth Avenue line was the last of the Manhattan subway lines to be built, and the most complex due to the prior existence of the BMT Broadway, PATH's 6th Avenue line, and Amtrak/LIRR tunnels. Ground was broken on March 12, 1936, and service between 47th-50th Streets and West 4th Street (lower level) began December 15, 1940. The 6th Avenue line was constructed as a four track subway between the 53rd Street junctions and the 34th Street/Herald Square station, and two tracks south of 34th Street connecting to the local trackways at West 4th Street lower level. The four-track subway along Houston Street from West Fourth Street to 2nd Avenue, and the two tracks further to East Broadway, was completed earlier, with shuttle service from West 4th Street beginning in January 1936. The Rutgers Street tunnel and the York Street station on the Brooklyn side opened April 9, 1936. Two tracks, one island platform. This station was constructed as part of the larger "Chrystie Street" connection project, since a new terminal at the end of the 6th Avenue line would be required for the new services. Provision for the extension from 47th-50th Street to 57th Street was built into the 53rd Street junctions during the original construction of those segments of the line. The 63rd Street cross-river tunnel was in the planning stages and construction on it would begin in the 1970s. 57th Street served as a terminal station until 1988, when the 63rd Street line was connected to it at the north. There is no color tile band, just vertical light beige tile. The mezzanine has extensive use of glass partition walls making up the fare control areas. There are three fare control areas, which are connected by the mezzanine. The south third of the mezzanine features high exit turnstiles and has some chained shut slam gate exits. The station is very clean, well maintained and very plainly functional. The platform is extra wide. Four tracks, two island platforms. The track and platform arrangement here is slightly unusual. The north end of the downtown platform ramps up, and is at a higher elevation than the uptown platform. The tracks north of the station run on three levels to form the flying junction at 53rd Street connecting the IND Queens Boulevard line into the 6th and 8th Avenue trunks. To accommodate the track arrangement in the junction, the southbound platform has the positions of the "express" and "local" tracks reversed. Trains entering 47th/50th Street station from the west (from Central Park West) enter the station on the westernmost of the downtown tracks; trains entering from the east (from Queens Boulevard) use the eastern downtown track. Between 47/50th Streets and 42nd Street the southbound tracks cross over each other (not at grade). Thus it can be said that the southbound side of the station has the traditional placement of local and express tracks reversed. The station has a massive mezzanine which connects to many Rockefeller Center buildings outside the fare control. There are four sets of exit stairs from the two island platforms. The south two connect to 47th and 48th Sts., the northern pair to 49th and 50th. The tile is white with an orange tile band with black border and there is no name tablet. Four tracks, two island platforms. The full mezzanine has green tile at the stairs on the west wall and red on the east wall. The tile is white with an orange tile band with black border. The I-beams are painted a reddish-orange. The long passageway to Fifth Avenue (and the #7 train) features brown glazed brick with various color sections. There are porcelain laminated photos of the old Crystal Palace which stood at this corner. The passageway was added later in the life of the station. Originally, a transferring passenger picked up a paper transfer when leaving the one station, then walked across the street, entered the other station, and dropped the ticket into a collection box. This system, similar to the one at the BMT Franklin Avenue and IND Fulton Street transfer, was routinely abused. One could easily leave the one station, spend the day in midtown Manhattan, and reenter by the other station on the same one fare. South of 42nd St., the mezzanine extends all the way to 34th St. (outside fare control) but has been closed off for many years. The long mezzanine had no real transit purpose and it is unclear why it was built. Plans were afoot to extend the PATH/Hudson & Manhattan Railroad to Grand Central; the mezzanine could have been built anticipating this extension either as a right of way or as a means to block the extension. There was an exit to street level at 37th St., but no traces exist at street level of this exit. While it was open it was dimly lit, poorly maintained, and risky to walk through. The closure came in the mid 1980s after a passenger was murdered in the passageway. With the tunnel so lightly trafficked and with no transit crew nearby, there was no expectation of help. It is now used for storage. From time to time, access doors are open at the 40th St. fare control from which one can see down the length of the passageway. Two side platforms and two tracks. This is a local station with two separate platforms, and no crossover between directions. 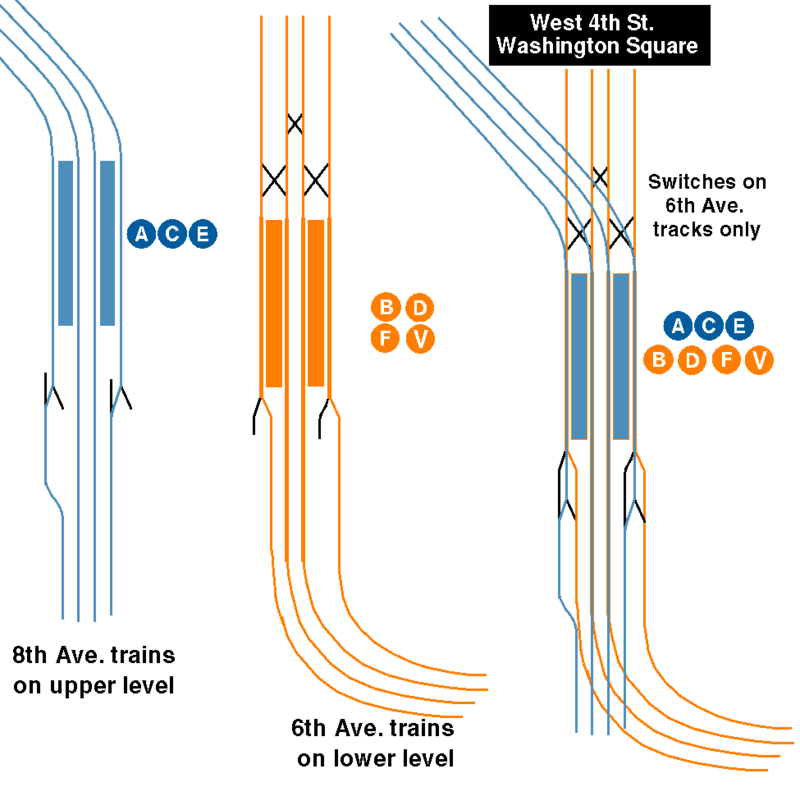 The layout here is as follows (west to east, facing north): Downtown subway platform; downtown subway track; downtown PATH platform, downtown PATH track; uptown PATH track, uptown PATH platform; uptown subway track, uptown subway platform. 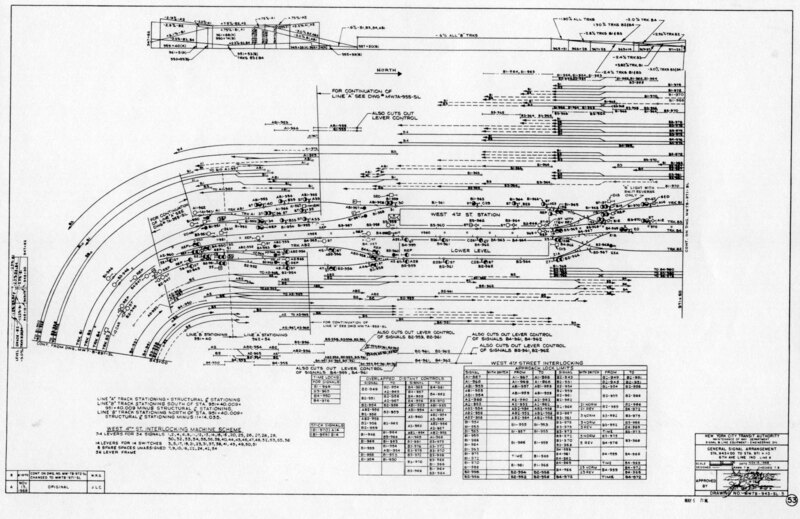 The 6th Avenue Subway express tracks were built in the 1960s and are below all of that. Provision was left for the addition of side platforms along the express tracks if the need someday arises. An emergency exit from the express level is noticeable along the subway platforms. Two side platforms and two tracks. Another unusual and complex station, 14th Street on the 6th Avenue line ties together the pre-existing PATH subway (1908) and the BMT Canarsie line (1924) running crosstown on 14th Street. First, the local tracks were weaved through the complex in between the PATH and BMT in the late 1930s; then the express tracks were built later, in the 1960s. Again, the provision exists on the express level to add platforms if the need arises, but adding in the access to these platforms is going to be a serious engineering project! A common entrance to the subway and PATH, with separate fare controls, is at the 14th street end. There is a typical full IND mezzanine over the station, largely unused and dimly lit. At the north end there is an exit to 16th Street. Fare controls are at both ends. Transfer to the BMT Canarsie line is made from the south end of the IND 6th Avenue platforms. Stairways from each platform lead 28 steps down to an intermediate mezzanine, then down to the Canarsie Line's island platform. Four tracks and two island platforms. Tile is white with blue stripe and black border. There are slate blue accent tiles at regular intervals. The fare control is up 21 steps from the mezzanine. There is a crossover between directions via the mezzanine. South of this station the line divides into two branches to Brooklyn: via tunnel to the IND lines and via bridge to the BMT lines. There has long been a transfer to the downtown local train of the IRT East Side's Bleecker Street station, via a glass-walled passageway. In 2012, a transfer opened to the uptown local platform, along with new stairway, escalators, and elevators. Artwork Hive, Leo Villareal, 2012. "Kinetic" lighting installation in the IND-IRT transfer mezzanine on the uptown side of the IRT station. Two island platforms and four tracks. Tile band is purple with dark purple border, and no name tablet. Columns are concrete. The center of the platform has a huge concrete column with built-in benches. There is evidence of a removed center exit. The north exit (Houston St./Second Ave.) and mezzanine are very dim and despite leading to the station's namesake avenue is only open on a part-time basis. The south mezzanine (to First Ave.) has an intermediate level, with the fare control 8 steps up from this level, and is open full time. The four tracks at 2nd Avenue were originally, but not now, the same four as at Broadway-Lafayette. A view of the area track map will illustrate this point. The center tracks at Broadway-Lafayette were connected to the two tracks of the Chrystie Street Connection coming north from the Grand Street Station and the Manhattan Bridge. The local tracks continue unbroken between Broadway-Lafayette and 2nd Avenue. The track in between the uptown local and express, now used by the connection from the Williamsburg Bridge was original construction, formerly used as a layup track. Presently the stumps of the express tracks at 2nd Avenue are tied to the local tracks and has a crossover just west of 2nd Avenue. This makes 2nd Avenue into a terminal station for short runs and it is planned that one route from the upper section of the The Second Avenue Subway line would end here. The center tracks continue behind the wall to about Avenue A. They would have continued to and under the East River as part of the IND Second System lines. Before the mid 1980s they were open and used for laying up trains from time to time, but they were quickly inundated by squatters who domiciled in the nooks and crannies of the tunnel. When they were cleared out by 1990 the tracks were closed off. Evidence of the provision for the Second Avenue Subway is found in a lower transverse ceiling across the platforms and the discontiguous mezzanines. Features tile colors like Second Avenue. Northbound has concrete columns and southbound has I-beams, both in purple. The name tablet colors are reversed. There are two tracks and two wall platforms. fare control is in the center on the mezzanine level. indicates that they might have been there. If anyone has any information, please send it along! Tile is off-white brick with purple border. South exit is up 18 steps, a bend in the passageway then 14 more steps and a ramp to the fare control. Outside the control is a ramp to East Broadway. The north exit leads to Madison Street and also has a ramp to East Broadway (outside the paid area). The lower mezzanine is tiled over on the north end along with a closed stairway. There is a closed center exit which is very narrow and a long closed extreme southern exit. The north upper mezzanine extends further north outside the paid zone. We've passed under the East River through the Rutgers St. tunnel, and arrived at this deep-level station, which has round deep-bore walls and a narrow island platform. Tile is matte finish white brick with purple tile border. The center of the station features round columns with the tile border and white matte finish brick. The ceiling features some barrel vaults. The north exit leads to York and Jay Streets. There are 32 steps to a long, steep ramp to the fare control. The upper mezzanine is dim and is the site of a new fan plant. There is no south exit. Two tracks and two side platforms. Opened in 1967 as part of the Chrystie Street connection work. There is an extra exit being planned to the street, no details available but a contract has been issued. The tile is ivory in a vertical arrangement with a robin blue tile band. The Grand Street name is in white. A stylized train artwork is at the stairs to the mezzanine and also in the mezzanine. Rumor has it that the walls along the platforms are designed to be removed, for conversion into two island platforms; space for two tracks which would have been used by The Second Avenue Subway is said to be behind the walls. It isn't clear if this is actually true or not. In any event, the more recent plans for completion of the Second Ave. line would probably not use these provisions. The immense growth of Chinatown can be appreciated by watching this station. When it opened in 1967 only a few riders got on or off here; the modest entrances were in keeping with this light traffic. Steadily the ridership here swelled. Today there are portions of the day when the platform is filled end to end with people pressed against the wall and toeing the platform edge. After Grand Street, the trains from the IND 6th Avenue Subway cross the Manhattan Bridge and arrive at DeKalb Avenue station. South of the station where the tracks curve onto Manhattan Bridge are the original trackways from the BMT Broadway station at Canal Street. They are best seen from the back window of a Brooklyn-bound train. By Peggy Darlington, Ron Aryel, and David Pirmann. Map by Timothy Anderson.